Top quality covers for your top quality transcripts. Deliver your transcripts professionally bound in one of Pengad's distinctive transcript covers. 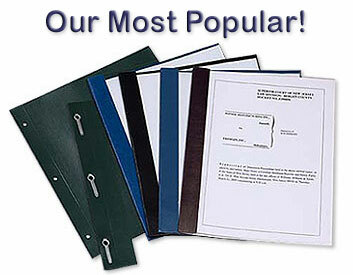 The A6 cover is the most popular and is perfect for every application including the binding of condensed transcripts. This two-piece set has a solid back and a clear front with a matching side strip. It's available without fasteners or with three convenient, self-contained fasteners to save you time. Professional Premium covers have a glossy, embossed, leathergrain finish. They're the perfect choice for the professional who is concerned with their image. Premium covers are a solid choice for a more traditional presentation. Available in a variety of classic colors with a beautifully embossed leatherette pattern. Expensive looking but inexpensively priced; the super gloss finish Premier is our most economical cover. Available in 6 brilliant exterior colors with a white interior that's perfect for personalizing. Our lightweight Linen covers are white on the inside to offer flexibility for personalizing inside your cover and out. Outer cover is available in 5 color choices with the classic linen pattern. The matte finish colors, along with the recycled content, make our Recycled Linen covers a favorite. Three rich color choices offer an appealing change from the classic linen. © Copyright 2019 Pengad, Inc. All Rights Reserved.